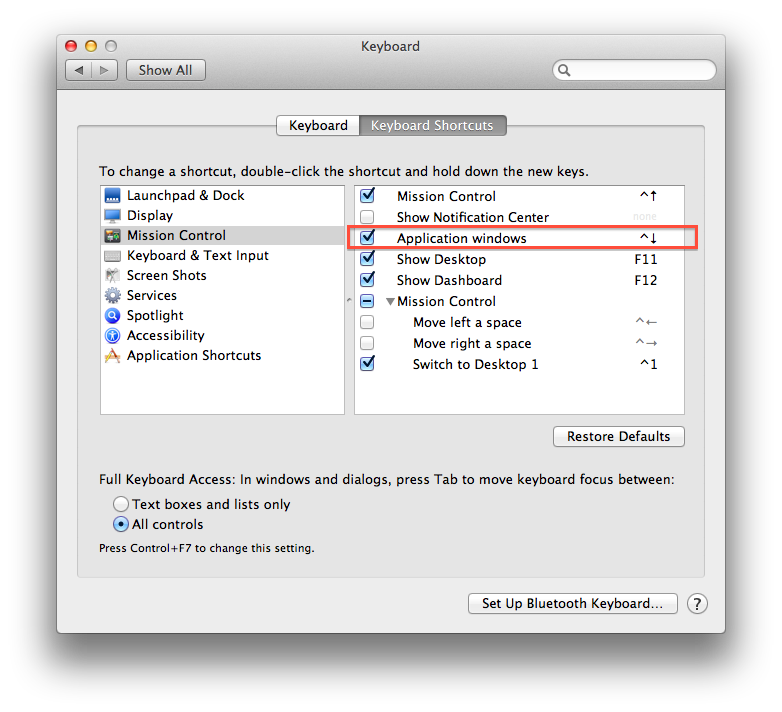 Is there a keyboard shortcut to restore a minimised application window from the Dock? Almost all Apple Mac OS X applications respond to the Apple + M command which minimises the current application window to the Dock, which is fine. I can then use Command + Tab to cycle through my running applications - including the minimised application, but selecting the application with the minimised window neither restores the minimised window, nor sets focus to the minimised application window in the Dock so I can restore it without having to reach for the Mouse. Update: Thanks for the answers, however the consensus seems to be to use the 'Hide' feature (Apple + H) instead of minimising, as it's easier to get the window back using Command + Tab. Command + Tab until you get the app's icon. Before releasing the Command key, press and hold the Option key. You must switch to another app and let it take focus first. In other words, you can't just Command + Tab to another app and before actually selecting that app (by releasing the Command and Tab keys), switch right back to your minimized app, which you might attempt to do if you minimized it by accident or just simply changed your mind shortly after minimizing. Both the Command and left Option keys must be pressed on the same side (left or right) of the keyboard. Push the down arrow key (↓) to select the minimized windows. Control + ↓. If App Exposé is selected in Trackpad preferences, you can also swipe down with three fingers. I asked for assistance at the Apple Genius bar in Aventura, and while they didn't have an answer, they did suggest using the Hide feature instead (Apple + H) which works well because when I Alt + Tab back to the application the hidden window is shown. I don't know of a direct way to restore a minimized window, however, you can get keyboard focus in the dock by pressing fn+control+F3. Then select the item you want via the arrow keys and press space or return to restore it. Cmd + Tab to the app you want to restore. Release Tab, but keep Cmd held down. Now press Option (a.k.a. Alt), and while it is held down release Cmd. I have been "training" myself to make use of Cmd + H (Hide) on Mac OS instead of minimizing. If you hide an app, then once it is selected via Cmd + Tab it pops back up on-screen. I would strongly suggest using Witch. This lets you bring back minimized apps, as well as 'orphaned' apps, after you have closed the main window. You can also directly access the different windows within an app. Well worth the registration fee; about 10 euros. Depending on how your keyboard is set in system preferences, the shortcut to focus the dock may be Ctrl + Fn + F3. You can launch the application again to display the last minimised windows. For example, if you minimise Safari, clicking the Safari icon in the dock or launching it via Spotlight will un-minimise the last minimised window. I've only checked this with the 5 apps I have open but it works in each of them. I guess you could write an applescript to perform this function and assign it to an keyboard shortcut. I have found the answers to this question helpful for this as well. For an easy way to invoke App Expose to get at minimized windows for current app use Cmd-Down; Down; Enter. What happens when I've closed all of an application's windows on OSX? Is it possible to maintain Chrome's ⌘-shortcut for background tab, while using AppleScript to automate the creation of a new tab?